Some great views and a good suggestion of places to walk in this video. A festival of guided walks: where nature and heritage lead the way In Mortimer Country, the area covering North Herefordshire/South Shropshire border. Mortimer Country, is superb walking country, so local tourism group Mortimer Country Ltd has put together a series of guided walks throughout the Summer. The guided walks offer local residents and visitors a chance to explore Mortimer Country’s outstanding historical and natural environment. Booking required, see website for details. 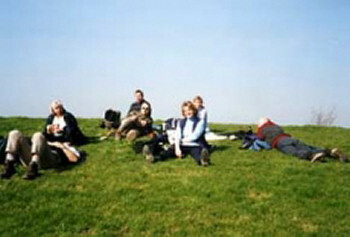 The original walking festival now in its 18th year. All the walks are led by experienced local volunteers and enquiries about specific walks can be made directly to the Walk Leaders who are glad to help. Contact for any other queries. Where a walk finishes in Bishop’s Castle or near a cafe or pub, there will be the option of tea and cakes or a pint. Walks costs £3 per person per walk; under-sixteens are free. ‘Walk Details’ show any other costs involved, like possible transport fees. When transport is needed to the start of a walk, we have tried to use local buses or community transport. The Magnalonga is a mobile feast, allowing you to stop at various points and consume mostly locally-based produce whilst taking in a scenic route around Ludlow and its countryside. The food is washed down with locally produced beer, cider and perry plus water is also provided. The walk itself is about 8 miles and involves some stiles, gates and normal footpaths. Booking opens in Juneand is essential. Starting times are staggered to allow all to enjoy the countryside. A race it certainly is not. Much Wenlock 8th to 11th September 2017 inclusive.